A small business owner in a local market, whether you are in the retail, consumer or business to business space, we are pretty sure you have your hands full. You are trying to run your business, manage cash flow and hiring, scheduling and training of staff, let alone dealing with customers, plus being the businesses industry expert and driving growth. When someone starts talking marketing, not to mention digital marketing or specifically content marketing, it’s enough to make any business owner’s head spin. Am I right? Is content marketing a necessity for the small business? The extremely short answer is YES! Are we saying that small business content marketing is required because it is something we do, or is there data that shows why content marketing, blogging, graphics, video and other digital content marketing is so important for the small business? Again, the short answer is YES. 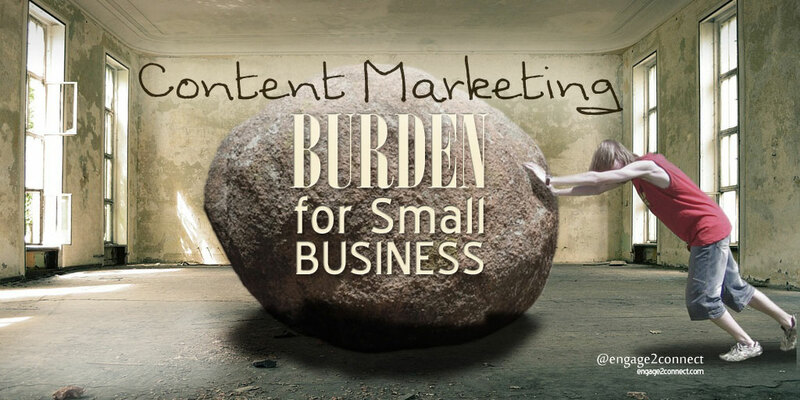 Should The Small Business Be Using Content Marketing? A new study of over 22,957 brands and 50 million pieces of digital content analyzed by TrackMaven, shows what should be an alarming requirement to any small business not already utilizing consistent content marketing. The research conducted across all major industries and included 6 of the top digital marketing and social media channels, such as Facebook, Twitter, Instagram, Pinterest, LinkedIn, and blogs. The research tracked and measured an astonishing total of 75.7 billion interactions and came to some very interesting conclusions. Brands are having to create and post MORE content, and even when they do, they’re getting even less engagement. Here are some of the startling facts derived from the content marketing study. – The total amount of created content output required by brands is increasing – a lot. – There’s only so much content users can consume, making content quality, quantity and consistency extremely important for small business. What Local Small Businesses Must Do Now? Small businesses need to understand that they are no longer only competing locally for their prospects digital attention. Now they’re competing with ALL digital content that can reach their audience, whether it comes from someones friend, or another local business. It also means that you are competing with content created by statewide brands, national companies and even worldwide organizations and sources that are creating and distributing their content online. Since there is only so much content consumers can take in, content marketing for the small local business is like air. You have to have it and it needs to be good if you are going to survive, let alone thrive. With US adults spending an average of 5.6 hours per day on the internet, from different devices and on all marketing channels from search, to social, to video and regular websites, small businesses that don’t see these changes and take decisive action are going to suffer. Now that adults discover both local and national businesses, content, products and services digitally and more increasingly from their mobile devices, small businesses must now look at their marketing as multi-channel and competing worldwide like never before. Your local small business must have an integrated digital marketing strategy that is highly targeted for each specific digital channel that incorporates unique content marketing. Small businesses must also be extremely active on social networks based on that strategy that not only incorporates substantial content creation efforts that stand out, but also reflect a human and personally, timely and responsive approach to customers that engage with your content. Strategy – A content marketing strategy isn’t important. Yes, you read that correctly. But please don’t misunderstand what is being said. The right digital marketing strategy is the most important thing you should be focusing on right now. It should include content marketing, multiple channels and have mobile as the centerpiece. A one size fits all, or cookie cutter strategy just won’t do it today. Your local small business content marketing and digital marketing strategy has to come from data, research and be highly customized to your specific business, local market and industry. Integration – Increasing traffic to your small business website might just be disastrous. If your website isn’t up to date with expected design and style elements, and isn’t optimized for mobile devices of all kinds, you are going to do more harm to your business than good. People may come to your website, but they will quickly leave. That first impression really is more important than ever. Additionally, your small business website must contain strategically developed content that works within a funnel to move your visitors where you need them to go. At the same time, each component of your website, social, search and content marketing has to strategically and coherently work together to overcome the challenges of digital marketing facing your small business today. Consistency – Finally, not only do you then have to create content, you have to do it consistently. In fact, the more consistently you create quality content, the more effective your search marketing, social media marketing and content marketing will be. In reverse, the less consistent you are at continually putting out new, creative, unique content that your target audience wants, the less effective your search results, web traffic and overall digital marketing will see. Let’s face it, the burdens associated with a small local business are frankly pretty overwhelming. Adding digital marketing and content marketing for your small business, to these requirements and responsibilities can leave you feeling even more exhausted, both physically and mentally.